New York-New York Hotel & Casino is a hotel and casino located on the Las Vegas Strip at 3790 Las Vegas Boulevard South, in Paradise, Nevada. 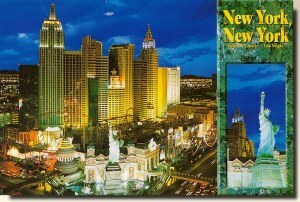 New York-New York uses the New York City influence of its name in several ways. Its architecture creates an impression of the New York City skyline; the hotel includes several towers configured to resemble New York City towers such as the Empire State Building and the Chrysler Building. In front of the property is a pool representing New York Harbor, with a 150 ft (46 m) tall (half-scale) replica of the Statue of Liberty, a roller coaster, and replicas of the Brooklyn Bridge, Soldiers and Sailors Monument, the Whitney Museum of American Art, Ellis Island, and Grand Central Terminal, among other well-known structures [wikipedia].